I was having a conversation at Telford with one of your countrymen and the USA National Convention came up in our discussion. One of the things we talked about was that the convention moved annually and various chapters took on the responsibility of running the event. I surmised that this was due to the vast distances between cities in the USA so that everyone has a fair crack at the convention being closer (relatively) in due course as years go by. He agreed that this was probably the case, but also surprisingly he said that he wished that the convention was held at the one venue all the time close to a large city with an international airport close by with good road and rail links. He also mentioned that he would like to see the governing body of IPMS USA run the show in a similar fashion to IPMS UK. That way the US convention could develop it into a show similar to IPMS UK scale Modelworld at Telford as he felt that the convention although very good each year could not go any further than the current format. He also mentioned that this may be due to the financial responsibility that the chapter takes on when it is their turn to run the event. I suggested to him that IPMS USA probably has insurance in place to cover the risks for the chapter involved and explained that IPMS UK has approached this differently and become a limited company to protect every one of its members. It was interesting to speak to a stateside member and share information about our different approaches. Personally, I have not been to any USA Convention so far but would very much like to as I have heard that us Brits are always made to feel very welcome at your main event. There are a number of problems that must be tackled before the centralized nats idea could be done. It's been discussed here before. It takes me longer to drive from Jax, FL to either P-Cola or Miami, than it takes a Brit to drive from London to Glasgow....and I don't even leave my state! Just in case your wondering that’s also a joke!!!! I tried to get it as close to the middle as I could which is Lebanon, Kansas. I think I got it a smidge to the right. 😉 It is however proportional. I was surprised that the UK only took up 8 degrees of Latitude. Telford is on the edge of the lower third of the country. From anywhere in the country, you can get there in less than a day. I drove further to get to Phoenix then you would drive from the northern tip of Scotland to Telford. Pete eloquently showed the size of mainland Britain on the USA map, and that is why I surmised in my original thread as to why your National Convention moves annually. I do not know if a centralised permanent annual location would work or not in the USA despite the size of your country, but the American gentleman I spoke to last year seemed to think it would. If the convention was in say New England one year and Seattle the next it will never suit everyone, but that is the nature of how it has to work however. Regarding Telford, the show attracts IPMS contestants and IPMS European branch displays as well as individual visitors who regularly travel from all over Europe each year to the one venue. 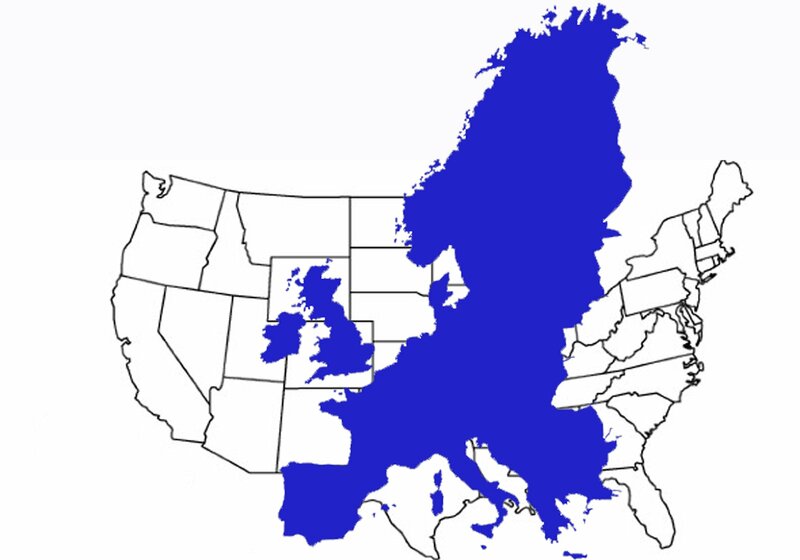 Maybe a map of Europe overlayed on the USA map may put Telford into better perspective..
Gil mentioned about comparative driving distances. Agreed, but the driving experiences between our clogged up UK roads and vast expanses of clear interstate freeways are very different. Having done both I would rather drive in the US. Unless you have to pass thru Atlanta, Chicago, Houston, DFW, LA, San Francisco or the entire stretch of I-95 from Richmond to Boston.... sure! Noel, you have mentioned a couple of things that may apply but the real problem is what we somewhat concededly refer to as "Flyover" country. The vast majority of the population is on opposite coasts. The middle of the country is relatively sparsely populated. There are few places that are near the center that are an easy drive to the majority of the population and flying with models is hardly an easy proposition. Other than aircraft there really isn't an effective public transportation system(e.g. high speed rail) like Europe has. We are geared primarily to flying or driving. We use to have a great passenger rail system, but it is almost exclusively a freight system now and the cost of rail travel is the same as flying. Why would I sit on a train for two or three days when I can fly anywhere in under 5 hours? Travel in Europe is far superior to what we have here sorry to say. 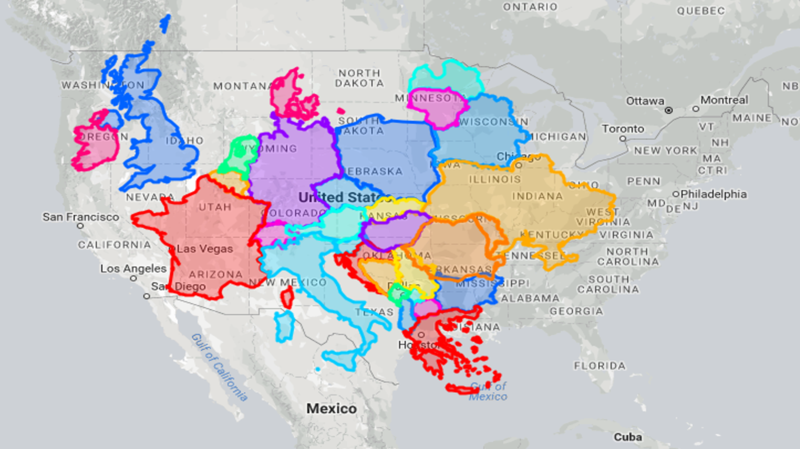 I will work on a map that shows all of Europe. That might be interesting. Did the same thing but this is pretty much western Europe. The map is also badly skewed by the mercator projection in the northern latitudes of Scandinavia. In other words they show a Norway, Sweden and Finland much larger than they actually are, but then this is simply a rough idea. I wonder how many eastern European modelers make it to Telford? I have to believe that like most shows, the further away, the fewer the attendees. But it still makes the point that it is quite hard to make a comparison between Telford and what could be done here. If you selected the major metropolitan areas down the true center of the US, you really only have a few venues, Omaha, Kansas City and Dallas. They are all at least a three to 5 day drive from either coast and there is virtually no viable alternative transportation to flying. It would be so nice to have a well developed high speed rail service like what it pervasive in Europe. It is kind of the conundrum of finding one place that suits few well and inconveniences the majority about the same or alternate coasts and make about half happy half the time. I think that moving it around actually involves a larger portion of the members and that is a good thing. It also tends to keep the experience fresh for all going to different locations. The only reason "fairness" ever entered onto it was because IPMSUSA used to rotate the bids across the land. So, there was an EXPECTATION that the Nats would "roll around" to your area every 3yrs or so. Thus, when a region (like the west) didn't bid, and IPMSUSA opened bids up to anyone, the MISSED expectation was what made it seem unfair to those who got passed over. That ended quite a few years ago now. The bids have been open to anyone for a while now and there's NO expectation that the Nats will "roll around" anywhere. While I'm sure that the Eboard takes into consideration which area of the country has been longest without a Nats when they consider the bids, there are no guarantees that the Eboard will pick the one that will help the region that's been starved for a Nats for a while, IF they get a bid from that region in the first place. The point I'm driving at is this: Once you decide to use ONE permanent location for every year, there's no expectation to wait til it comes to you. Thus, it's not "unfair" and no one is getting "cheated". Will some people always be closer and others always be farther? Sure....but then those who seem to attend EVERY year do so no matter what the distance (so no change for them); and those who only attended once every 3 or so years when it came to them could save money for 3yrs and afford to go JUST as often as under the old system (same as before for them too). There are lots of things that would have to be ironed out, but then many of those have already actually been done. The rest is merely adapting to change and putting our heads together to make it work; as we've always done anyway. I don't look for this to happen until the Eboard stops getting bids, or unless some city/hotel chain makes us a deal we just can't pass up (unlikely); so there's no need for anyone to get bent out of shape. Okay, I'll ask it. WHO (chapter, E-Board) is going to run the event EVERY YEAR if it's in the same place? We would have to dig deep in our (IPMS/USA) pockets and hire an outside convention firm (i.e. raise prices to the event) to handle the many, many day to day duties the host chapter now does. How do you divide up the profits of the event if outside help (they charge a fee plus percentage of profit) is brought in EVERY YEAR (contracts, hotel, event rooms, banquet) to handle the hotel? Which chapter runs the event EVERY YEAR? Do they get the lion's share of the profits? How is a chapter on the east coast going to get ( and pay for) all the personnel to the event (i.e. higher prices) in the central US? I promise you no one is going to volunteer to host the nats EVERY YEAR. Rusty, I would imagine that a fixed location would probably need organising at National level by IPMS USA not chapter leve!. That is how the Telford International Centre has become a fixed venue. We have posts on the exec specifically for running the show. Look at the UK website. Incidentally with a fixed venue at Telford the IPMS UK exec gets good rates from all the big local hotels because they can fill all their rooms over the weekend. Also, many smaller hotels and boarding houses in the area benefit too. Pete asked about how many Eastern European visitors attend Telford. Actually, quite a lot come over from the Czech Republic, Slovakia and Poland, many of who do well in our competition. The IPMS branches of those particular countries have stands each year at the show. Even IPMS Russia attend. Although Europe has a good rail system the vast majority come over by road to get to the show each year. In the US naturally there are pros and cons over the idea. Gil, Respectfully, that is the most galling bit of sophistry I have read in a long time! You seem to say ‘ Californians, New Englanders, now, the show is NEVER going to be near you, so, happily, you can stop whining about it!’ That would be clearly “unfair.” It is also worth remembering that the old system of rotating geographically reflected the sense of fairness that the organization felt toward the entire membership. It was discarded not because the current system was better, but because the bids dwindled so that we had to take whatever we could get regardless of location. A policy of a permanent venue that many members will never be able to afford to reach, either due to lack of time or money or both, betrays the typical ‘ take it or leave it’ mentality of a leadership of an organization dangerously indifferent to the legitimate needs of its members. This would be particularly counterproductive in an organization that is constantly concerned about membership recruitment and retention. A reasonable compromise would be to work with a single hotel chain that has venues all across America (this is not a new idea) and try to cut some kind of deal based on offering garunteed, predictable business. Trying to be fair to as many as possible is not an unworthy aspiration. Nor is it a sign of weakness. Right you are Nick! That's why SO many other organizations have their annual conventions in the same place every year.....because they're deceiving, uncaring, and decidedly unfair to their own people too! Perhaps besides accusing me of being deceitful, you'd like to comment about my mother too? My OPINION, as I have logically tried to argue above, is that IPMSUSA would survive, adapt, and the Nats be attended in much the same way as it is now, IF we had it in the same place every year. You may disagree with my conclusions, but how is that argument being deceitful; or do you not know when you use the word "sophistry" you're accusing someone of purposely lying? And as for finding a hotel chain that'll cut us a break? If you'd actually paid attention to Ron Bell while he was in charge of the Nats for over a decade, you'd realize that as hard as IPMSUSA tried to get such a deal, it was NEVER going to happen. We're just too small of potatoes to them. IPMSUSA has tried that; repeatedly. So the reality is what's left: keep on the way we have (probable, until FORCED to change); or look at other options like a single location that might give us the best in affordability, location, and accessibility to MOST of IPMS. Rusty: I have no desire to dig into all of the nuts and bolts of putting on a Nats (which you are very aware of yourself), but you HAVE to stop thinking of how it's been done up til now. That's the first mistake almost everyone makes by asking: "how can we do it like we always have, but in the same place each year?" You can't! You have to make changes. My point was that some of the problems that stood in the way in the past are now already solved, such as a viable year to year registration system. As for labor, many Nats have (and are) using a lot of volunteer labor so they're NOT dependent on the local club's limited pool of people. If you also start incentivizing volunteering by (say) comping their registration fee for Xhrs of work; then that pool of people might remain steady or even grow. IPMSUSA is already footing much (if not all) of the bill for every Nats. In fact, I'm betting that the Eboard is already grumbling (behind closed doors) about having to split half the profits with a local club that's doing MUCH less work than in years past. How long before they change that? And if IPMSUSA seems to be clearing $20,000 (before splitting) on a Nats, SOME of that might be able to be spent on labor, IF IPMSUSA saved the same or more in other areas by staying in one place. I can live with it as it is now. However, I'm also willing to at least consider using a single location. There's pluses and minuses to both. But I'm not going to outright dismiss a change just because I don't like it. I agree with you Gil. I'm all for change if it can be done for the majority of member's benefit. The reason I appeared to be beating the dead horse, was that Noel seemed to be new to forum and didn't have the advantage of past discussions on the subject. IF someone can come up with a workable solution to a one venue nationals, I'm all for it. Since I am the guy playing with maps in this discussion, I will add one more interesting fact. The 2020 convention in San Marcos, Texas is about as close as we are likely to get to holding one that is equidistant from both coasts. At 98 degrees West is it within 1/2 degree of Lebanon, Kansas which is the true geographic center of the USA. It will be interesting to see what the distributions of members in attendance is. To a point I tried to make earlier, if you use 98 degrees as the geographic middle of the United states, you don't have a significant number of large metropolitan areas near that. It looks like Omaha, Kansas City, Dallas and Austin/San Antonio is about it. If you stretched it a bit you could add Minneapolis and Denver. Now granted, there is no criteria that requires the convention to be in a major metropolitan area, but because of amenities located in such areas, I have to believe that it helps attendance and is a factor. I suspect the next point someone will make it that the geographic center is different than the theoretical population center. The answer is yes it is but not as far off as one might think. In point of fact it is fairly close. It is currently 6 degrees east in Missouri according to the US Census department. Also, that center has continuously moved west at the rate of about 3/4 degree every census(10 years) in the modern era. The point has been made in the past, that the membership is not evenly distributed or even consistent with the distribution of the population in general. I am not willing to expend the effort to check that. I simply don't know and frankly, doubt that anyone has done the regression analysis necessary to figure that out. So, my analysis of the single venue idea would be that if you used distance only, you would net the most inconvenience to the the most members every year as the majority of the population resides on or near one of the coasts. By rotating it coast to coast or some semblance of that, you would create maximum inconvenience for about half the the members every other year and significantly reduce the inconvenience the following year. This certainly isn't an answer to this discussion as there isn't a mathematical or accounting answer to it, but it does give some food for thought. One last thought about Telford. If you look at the population density of Europe. The densest population areas run from Italy, along the northern part of the Franco/German border and into southern UK. Make what you will of that. Rusty, you are quite correct that I have not had the benefit of knowing about previous discussions about the topic of a permanent venue. It has been interesting to read the differing ideas and opinions stemming from my original post .All from a chance meet and talk with one of your countrymen from Chicago in the Saturday morning queue to get into Telford last year! I would only have to say that Gil's example of other organizations holding a convention in one place every year primarily involves that organization's members who are usually being paid a good enough salary and are thus more able to afford to attend... in general. Of course, there will always be examples of people who don't manage their money enough; have issues etc. but overall, most organizations pay their members well; allowing them to afford a single venue every year. As one who has built sets for many of these conventions and events, I have seen it. And yes, there will be exceptions to the rule, always. When it comes to humanity, the only rule with no exceptions is that there are always exceptions that can be raised as an example. I know as someone who receives no compensation from IPMS-USA and who is lucky to make $1500.00 a year in income; their is no way I'll ever make a permanently centrally-located Nationals except under highly exceptional circumstances for me. It is why I have fully given up on any possibility of attending an AMPS Nationals because they never get close enough and most likely never will. Again, I'm almost certainly the exception to the rule about member's income, but it is a factor that should also be taken into account in balance with the expense of any location when considering this kind of idea. Okay, I'm heading back to my workbench now. I really need to buckle down if I'm going to find a way to build and get my 800 small scale models to Chattanooga like Mike Moore wants. LOL! The Duke makes a good point...as most "professional" conventions that are held in a single place yearly eiither compensate the employees that go there, or the costs are written off as a part of the business. Either way, it is more affordable for many of those types of conventions goers. On the other side of the ledger, there are several highly prestigious hobby shows that are held in the same place every year, and are extremely well attended both in numbers and with a lot of "regulars" who make it yearly. The Chicago Miniatures show and Wonderfest are two prime examples that immediately spring to mind. While Chicago is certainly a "hub" and centrally located for much of our population; Louisville KY does NOT fit that profile, although it is very "drivable" for many in the eastern half of the USA. As I've said, there are pluses and minuses to making a change, or keeping it the way it is now. All I'm saying is that the IPMSUSA National Convention could certainly establish itself as a prime attraction for modelers even IF it was held in the same place every year. It already has a certain prestige, and if it was run well, that prestige could grow.